NASA’s Juno probe, which has been in orbit around Jupiter since July, 2016 has provided scientists at the Jet Propulsion Laboratory (JPL) opportunities for research. 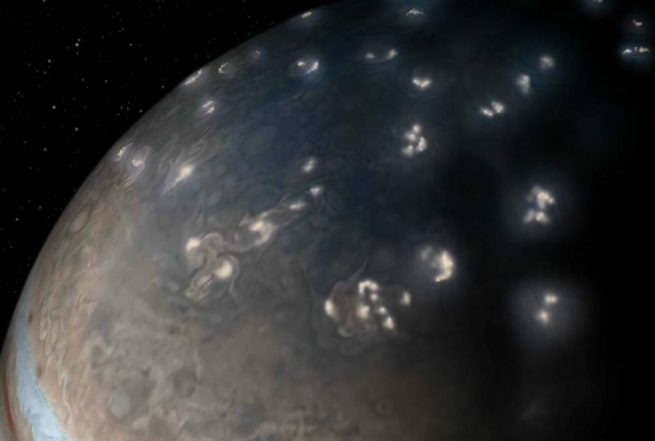 One such research paper, recently published in Nature, helps explain the nature of Jupiter’s polar lightning. Until now, all science instruments that have traveled to Jupiter (Voyager 1, Voyager 2, Galileo and Cassini) have only looked at the Jovian lightning in the visible spectrum. Juno, however carries onboard the Microwave Radiometer Instrument (MWR). This device records a wide range of frequencies allowing scientists to have a better understanding of what is happening at Jupiter. “No matter what planet you’re on, lightning bolts act like radio transmitters — sending out radio waves when they flash across a sky. But until Juno, all the lightning signals recorded by spacecraft (Voyagers 1 and 2, Galileo, Cassini) were limited to either visual detections or from the kilohertz range of the radio spectrum, despite a search for signals in the megahertz range. Many theories were offered up to explain it, but no one theory could ever get traction as the answer,” said Shannon Brown of NASA’s Jet Propulsion Laboratory in Pasadena via a company-issued release. Artist impression of lightning in Jupiter’s northern hemisphere. 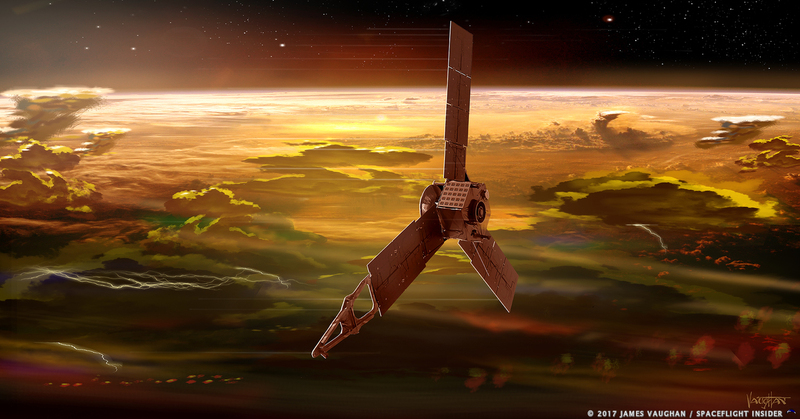 Information from the Juno spacecraft suggest a majority of the lightning activity on the gas giant is near its poles. Lighting on Jupiter is analogous to the lighting of Earth. Both are generated by heat. At Jupiter, the light reaching the planet is 25 times dimmer than what we see here on Earth. Earth has a lot of atmospheric convection at the equator courtesy of the Sun. That churning creates the instability in the atmosphere that results in lighting. Unlike Earth, Jupiter gets most of its heat convection from the planet itself. The Sun provides just enough heat to help stabilize the Jovian equator. This moves the churning effects to the poles of Jupiter where lightning is most prevalent. In addition to Brown’s work, another paper from Ivana Kolmašová of the Czech Academy of Sciences, Prague, and colleagues published in Nature Astronomy presents the largest database to date of whistlers, lightning-generated low-frequency radio emissions around Jupiter. The data set is almost 10 times the size of that collected during the Voyager 1 flyby. A peak rate of four lighting strikes per second is six times higher than the peak values detected by Voyager 1. This is similar to the rate seen here on Earth. More data about Jupiter’s lightning is scheduled to be collected during the thirteenth science flyby slated to take place on July 16. The Juno program continued to receive good news as NASA announced the mission would be extended through 2022. The spacecraft’s primary mission should draw to a close in 2021. However, data collection and mission closeout should continue into the 2022 time frame. This extends the spacecraft’s time on orbit to an additional 41 months. Currently the Juno spacecraft is in a 53 day orbit as opposed the the planned 14 day orbital period. Concerns about Juno’s fuel system, namely valve operation, led to the change in the spacecraft’s primary orbit. While this change has slowed the gathering of scientific data, it does not appear to have had a major impact on the mission overall. Juno is part of NASA’s New Frontiers Program, which is managed out of the space angecy’s Marshall Space Flight Center in Huntsville, Alabama, for NASA’s Science Mission Directorate. NASA’s Jet Propulsion Laboratory, Pasadena, California, manages the Juno mission for the principal investigator, Scott Bolton, of the Southwest Research Institute in San Antonio.